The density of the atmosphere falls with height from reduced gravity and it cools adiabatically. This fall of temperature with height is called the Lapse Rate. The return of latent heat by clouds causes a decrease in this rate. In addition, there are effects from convection, radiation loss and latitude. Figure 2 shows only the adiabatic and moisture effects. The surface of the earth and every level of the atmosphere radiates energy according to the Stefan Boltzmann Law, dependent on emissivity multiplied by the fourth power of the absolute temperature. The lapse rate means that the radiated energy from the atmosphere falls very rapidly with height, so that most of it comes from close to the surface. Radiation from the surface is upwards, but from the atmosphere it is in all directions, so that half of this radiated energy returns to the surface. By land, the amount returned depends on local albedo, but there is evidence that this is very low over the ocean where most is reflected. An alternative view of the climate has recently arisen from the environmental movement, which believes human activity can be shown to cause all changes in the climate – natural causes being merely responsible for “variability”. As there was no evidence to support this theory, the Intergovernmental Panel on Climate Change (IPCC) was established by the World Meteorological Organisation and The United Nations Environment Programme in 1988 to assess scientific evidence and formulate response programmes. It has supplied four major Reports and several minor ones, and is currently engaged on its fifth Report. 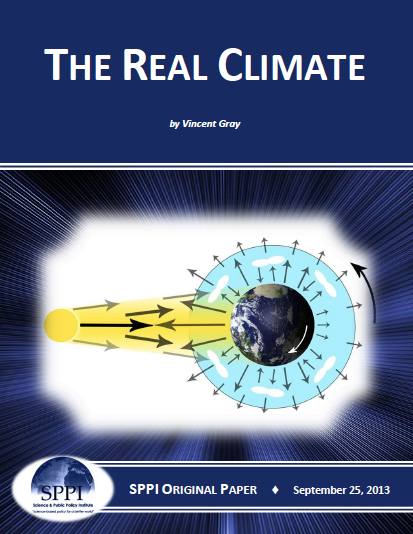 The unreal Climate theory is referred to as “The Greenhouse Effect”. It is based on a false theory of the action of a greenhouse by Fourier, who speculated that a greenhouse was heated by reflection of infrared radiation from the soil from the glass of the greenhouse. This false theory is used to justify a similar behaviour in the atmosphere. Fourier1-10 (1768-1839) made major contributions to the theory of heat flow in solids and to the mathematical simulation of irregular behaviour, but he lived before the discoveries of the mechanical equivalent of heat and the nature of radiation in the later part of the nineteen century. The First IPCC Report 35 (1990) presented what it called “the Greenhouse Effect” in this simplified diagram on page XIV of the Policymakers Summary. This model has hardly anything in common with the Real Climate.  The earth is flat.  The earth does not rotate.  The sun shines all day and all night with equal intensity.  Energy interchange in the climate is entirely by radiation.  Conduction, convection and latent heat transfer do not happen.  Energy flow parameters are constants with no variability.  Energy flow is "balanced" with input equal to output.  Air movements, wind, rain, hurricanes are ignored.  Chaos has been abolished.  The earth is dead: there are no living organisms, no trees, animals, birds or people. The energy imbalance of the earth is probably positive, but also extremely uncertain, so that the IPCC Climate model, as shown by Figure7 and also by the recent update (Figure 8), is quite incapable of giving guidance on the possible role of greenhouse gases in modifying the climate. Kevin Trenberth himself has correctly summarized the situation with the remark he made amongst the Climategate Emails; that the models are a “Travesty”. Nice to see SPPI and Vincent Gray finally accepting the details of the position first formulated by Principia Scientific International and the Slayers in asserting the greenhouse gas effect is junk science. 2. you clearly do not understand the science which you criticise, evidenced by your criticisms. 1. Name one word from Kevin Trenberth that is misquoted. 2. What specifically do you claim is a "mis-comprehension"? Be very specific and scientific in your reply and leave off the ad homs in compliance with the comment policy.